With these NITRO + RX Vega Limited Editions, SAPPHIRE is including a useful accessory: the SAPPHIRE NITRO Gear Card Support Bracket. This elegant, black nickel-plated and heat-treated tool helps stabilize and maintain the correct position of longer graphics cards to prevent PCI-Express slot damage or PCB bending. Thanks to its smart mechanical design, the bracket doesn't require any additional space and only touches the card by a movable knob with a rubber, soft top. SAPPHIRE's Quick Connect System provides a quick and easy solution. 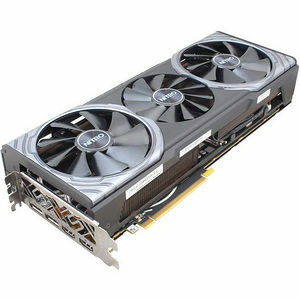 If there's a fan issue detected, the user doesn't need to return the entire card - SAPPHIRE's partners will send out a replacement fan directly to the customer or the retailer. Please contact your place of purchase to request a fan replacement. SAPPHIRE's channel partner will arrange the ideal solution for you to receive your replacement fan. With the SAPPHIRE NITRO Gaming Series cards' Intelligent Fan Control III, the fan starts precisely at 56 degrees Celsius to smartly balance performance against fan noise. This product supports both Legacy and UEFI BIOS. By factory default, the card itself is under Legacy mode. By pressing the button with SAPPHIRE logo, UEFI mode will be easily enabled.